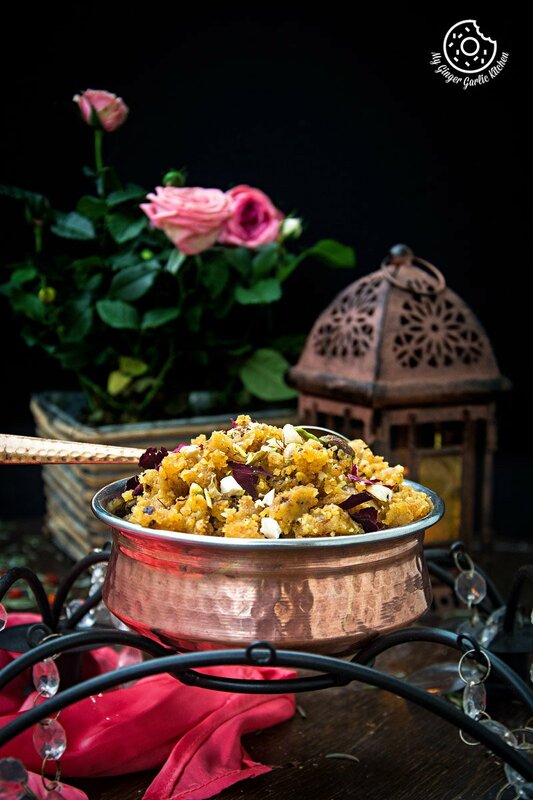 How To Make Rajasthani Moong Dal Halwa | Moong Daal Halwa Video Recipe — Rajasthani Moong Dal Halwa is a classic, rich and mouth-watering Indian dessert. 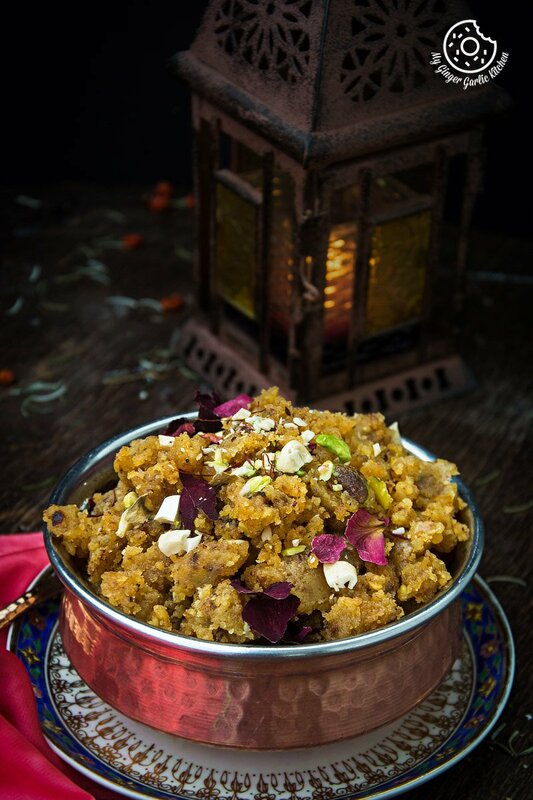 If it is the winter time then Moong dal halwa is one thing which is a must in every Rajasthani wedding and party. 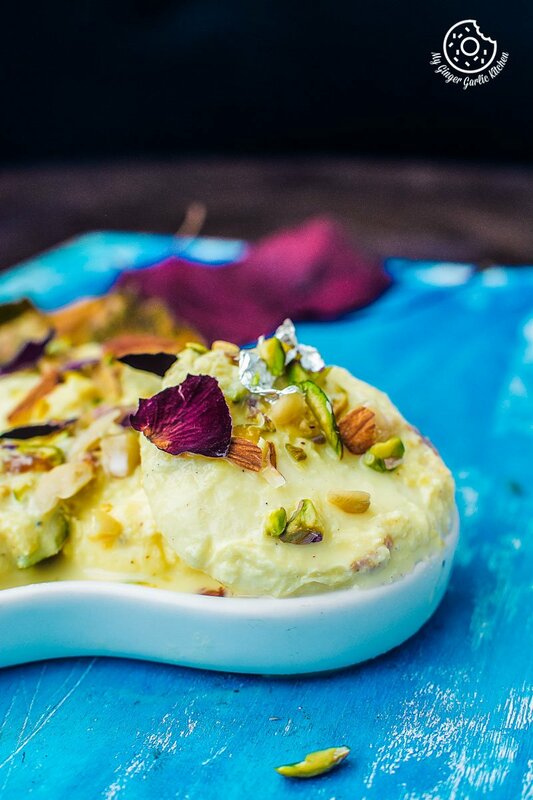 I want to start this new year on a sweet note and with a sweet dessert. 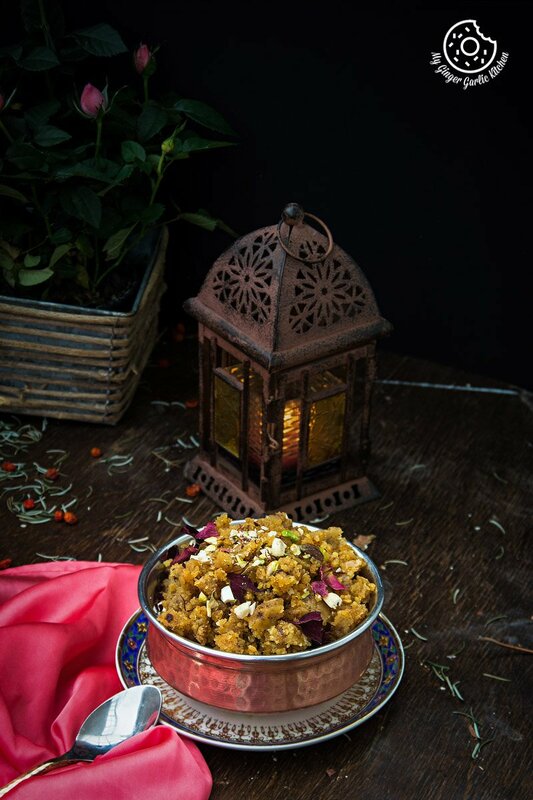 So ladies and gentlemen, let me present to you this very humble winter dessert ‘Rajasthani Moong Dal Halwa’ which hails from my roots, the western state of Rajasthan in India. By this time you all know that I come from Rajasthan, India. And whenever it comes to Rajasthani cuisine I get super thrilled. 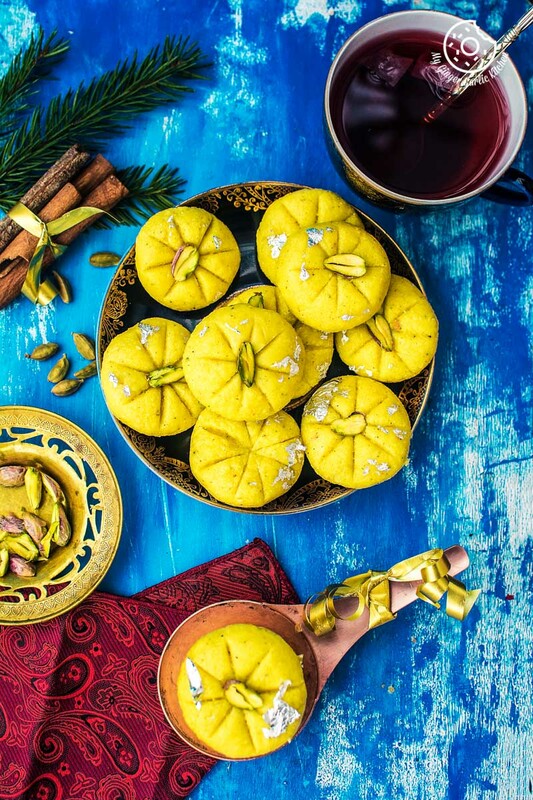 I already wrote about it in this post of Haldi ki Sabji, Dal Baati Churma, Jaipuri Aloo Pyaaz Ki Sabzi, and Jaipuri Mawa Kachori. I guess I get excited because I grew up eating that royal food and now living thousands of miles away from home for so many years, and so I don’t get to eat those delicacies as often. However, the ‘halwa’ I am sharing today was made for Diwali Celebrations, but I didn’t get time to share it back then and now I think it’s the right time to share it today. What is Moong Dal Halwa? 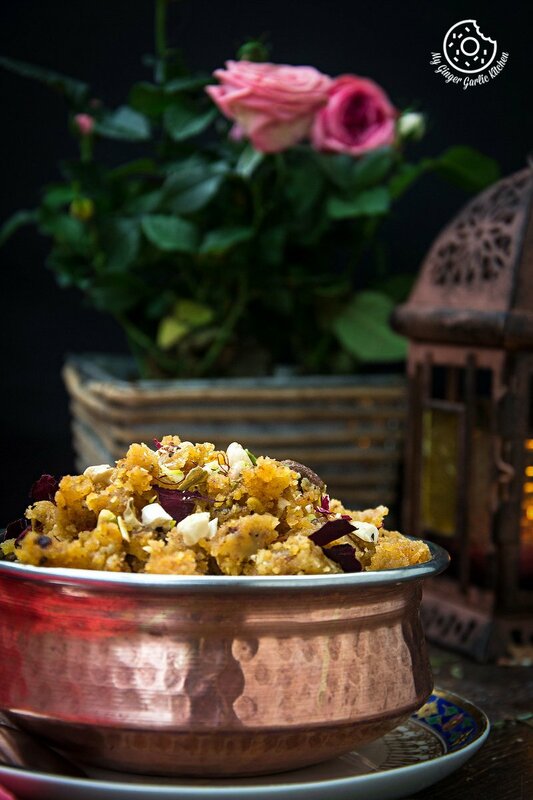 Moong dal halwa is a classic, rich and mouth-watering Indian dessert. 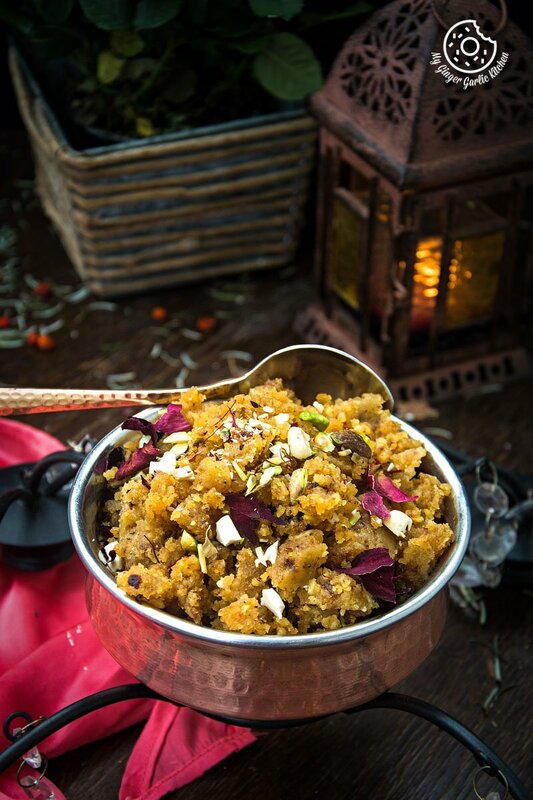 If it is the winter time then Moong dal halwa is one thing which is a must in every Rajasthani wedding and party. It sure needs a lot of ghee, but that is what makes this recipe unique and so delicious. The smell of roasting dal in ghee makes everyone drool. However, I do have to admit that one cannot have the large servings as it is little heavy on the stomach. But hey, who needs large servings when the small servings can satisfy your taste-buds and gives you a lot of vitality to go throughout the day. Before making this halwa, you need to make up your mind that it takes a long time and lots of patience to sauté the dal for this recipe. And when you have gained that willpower, then you can go ahead. 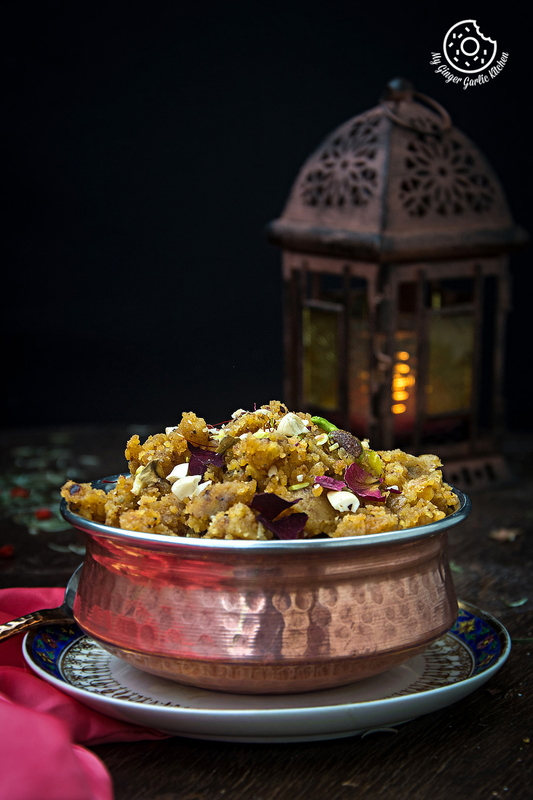 This rich halwa requires a lot of labor in terms of roasting. Soak and ground Moong dal and sauté in ghee on a low-medium heat for about 25 minutes. But believe me that all labor is worth because the good thing about this halwa is that it can stay fresh for a longer period. Make this halwa in a large quantity and then you can refrigerate it for up to one month. Whenever you want to eat this halwa, just pop it in the microwave for 2 mins or warm it in a double boiler. If you think halwa is too thick, add little milk while re-heating the halwa. Don’t heat it in any pan as it has a tendency to stick to the bottom, and you certainly don’t want a burnt smell in your halwa, especially when you have put it so much sweat, not literally though! ;). 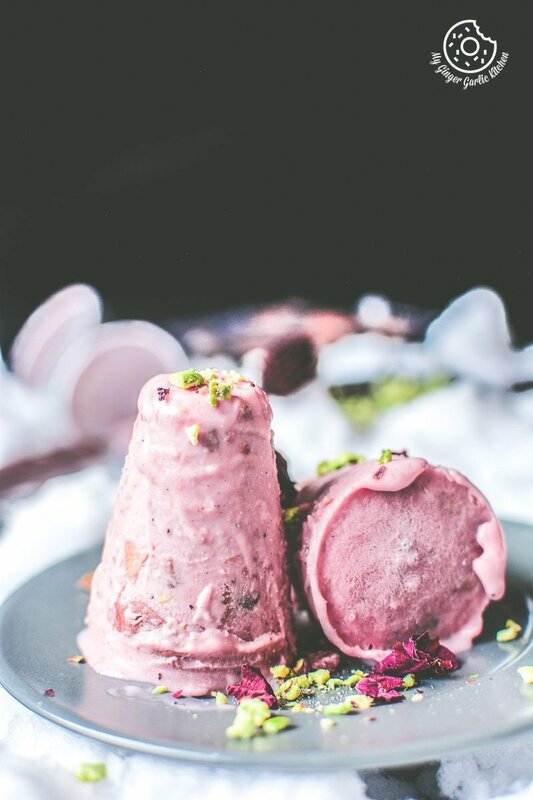 The point is that you don’t want to ruin the taste of your halwa, and thus you don’t want to take any risks. Even a non-stick pan doesn’t work, that’s what I have learned from my granny. So warm it and voilà, the halwa is ready to eat. 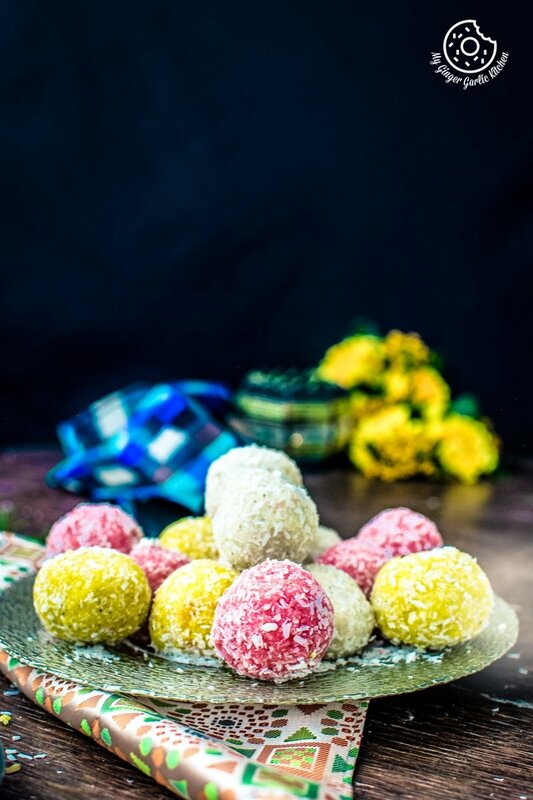 This classic recipe I am sharing today is my Granny’s recipe. This is the way she used to cook this Rajasthani delicacy. As it is a winter recipe, so my Granny toiled to make it at least 2-3 times every year during the winter time. She was so fond of this halwa that she even ate this Moong Dal Halwa for breakfast. On such days, this halwa with some roasted papads and a cup of steaming Ginger-Cardamom tea was her breakfast. And most of the times she skipped her lunch because she felt full and energized and doesn’t feel any hunger. But now I do the same; I just crave for this halwa for breakfast. So whenever I make this halwa I enjoy it for breakfast instead of a dessert. During lunch, I just eat some fruit. So, like the grandmother, like the granddaughter. I seriously can’t resist this halwa and I always look for an excuse to eat it. 😉 So I eat this for breakfast every morning until it is finished. This halwa makes great breakfast along with Rajasthani Mirchi Vada, or Jaipuri Pyaaz ki Kachori. 1. Soak the yellow moong dal in enough water for 3-4 hours. 2. Drain the excess water and wash well. 3. Grind soaked dal in a mixer to a make coarse paste. If needed add very little (about 2 tbsp) water, but don’t too much water while grinding dal, as it will take more time in sautéing. 5. Keep stirring the halwa until the raw smell is gone and dal is dry. It would take about 25-30 mins. 6. Add the milk and let it cook until the dal is dry again. 7. Add mawa and cook for 5-7 mins or until the ghee leaves the sides. Don’t forget to stir continuously. 8. Add sugar, mix well and cook on a medium heat for about 5 minutes. Stir continuously. 9. Add cardamom powder, chopped nuts and ghee. Mix well and cook on a medium heat for 1 minute, until the ghee leaves the sides. Stirring continuously. 10. 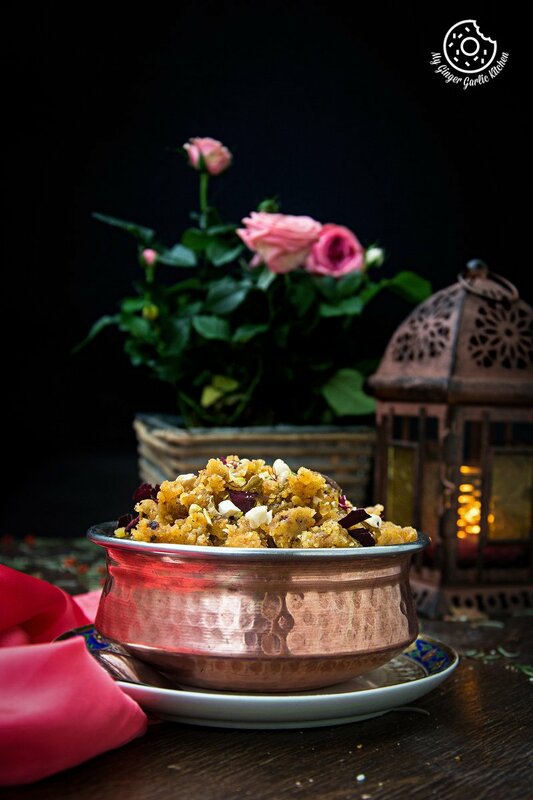 Garnish with dried rose petals and more nuts. Serve warm or hot. 1. 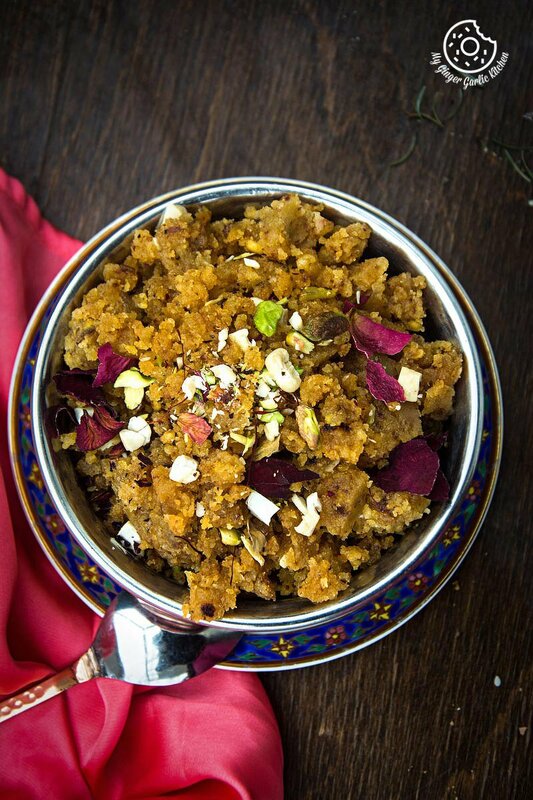 You can store this halwa for up to 4 weeks. Refrigerate it in an air-tight container.